Looking to hardtail your 1982-2003 Sportster? Well look no further! 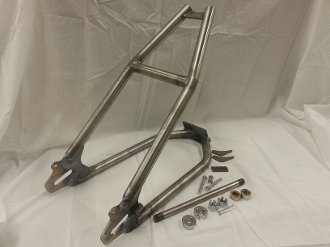 We have been selling this basic frame design for years, installed hundreds, sold thousands and using them we have built many complete bikes for customers and ourselves. All the bugs have been worked out of this system to make it a flawless, easy install for you! Approximately 4" of ground clearance depending on what tire you use. STRENGTH: We build these 100% here in our shop. They are made from seamless tubing, CNC cut plates and TIG welded. Unlike the knock-offs, our axle plates are welded IN THE CENTER of the tubing, not offset all the way to the inside. This is not only much stronger, it also looks the way it should. OTHER FEATURES: Our axle plates are CNC cut, not stamped, which means they are nice and flat. We clean up the axle slots on the mill so they are nice and flat as well. We use softail style axle adjusters! None of this goofy looking stock swingarm type adjusters. Sure, you have to run our axle but THATS A GOOD THING. (allowing stronger centered axle plates and softail style adjusters) At a price that includes our frame, axle, adjusters, spacers and everything you need for what lesser frames cost just by themselves. The axles are machined here as well from bearing ground stainless steel for a perfect fit and they will not rust! What does this mean for you? It means your buying a quality, USA made product that has been time tested, perfected and you have somebody to call with questions! We are more than happy to visit with you on the phone and help you if need be. We originated this style of hardtail for these years of Sportsters. We did not just buy somebody elses, take some measurements and claim to have the best thing since sliced cheese. With so many under our belt, and the technical support to back it up you can rest assured that your project is going to go together smooth!